Last time, we talked about the Chinese Zodiac. The Chinese zodiac is similar with twelve twelve constellations in western. So you may really want to know what your Chinese Zodiac is. So after you read below information you shall find the answer of your Chinese zodiac. It will be very interesting. As you know, each animal signs behalf on 1 year (Chinese calendar). There are 12 animal signs, so it will be repeated each 12 years. 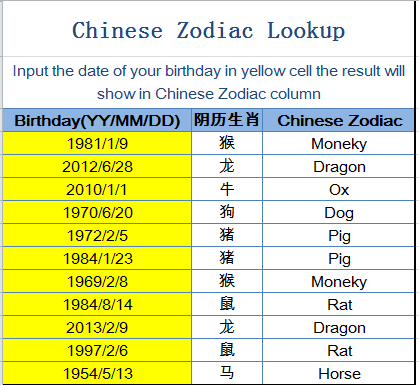 If you want to get the accurate Chinese zodiac you shall convert the date of your birthday to Chinese calendar. You will say that it is so complex to get the accurate Chinese Zodiac. J Do not worry about that we had prepared one excel tool-Chinese zodiac sign calculator for you to look up your Chinese Zodiac. It is easy to get your accurate Chinese Zodiac. It is easy to know the accurate Chinese Zodiac. Previous Post:Do you know the Chinese Zodiac?